Home | Tell Major Food Retailers to be Leaders in Farmworker Justice! Tell Major Food Retailers to be Leaders in Farmworker Justice! You may have noticed that big grocery store chains like Safeway, Trader Joe’s, and Kroger are starting to talk about social justice as part of sustainability and are offering more products making such claims. Safeway claims that “people are the core of Safeway’s operating philosophy” and has started offering more products claiming fair trade status. Trader Joe’s also has a noticeable offering of fair trade products and has signed onto the Fair Food Program. And Kroger has included a vague commitment to fair working conditions as part of its sustainability goals. Yet these commitments do not go nearly far enough to protect some of the most marginalized, including farmworkers, throughout its supply chains. If Safeway, Trader Joe’s, and Kroger are serious about commitments to people and fairness, farmworkers also need to be a more significant part of their business models. 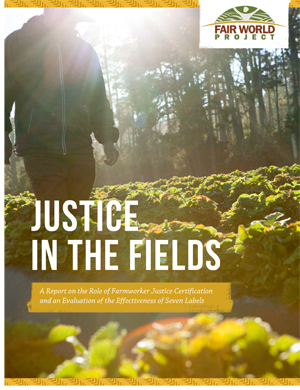 As we describe in our new report Justice in the Fields: A Report on the Role of Farmworker Justice Certification and an Evaluation of the Effectiveness of Seven Labels, farmworkers around the world face dangerous conditions including exposure to toxic chemicals and high rates of accidents, lack legal protections either because laws are not adequate or are inconsistently enforced, and receive low wages. Holding suppliers accountable for conditions and wages on farms. This includes full supply chain transparency, participating in a strong third-party monitoring program that includes workers and worker organization, and creating a meaningful and robust grievance policy applicable to all farmworkers in the supply chain. Promoting and prioritizing the strongest farmworker certification labels. Major grocery store chains including Kroger and Safeway have not yet signed the Fair Food Program agreement and most give purchasing priority to the weakest eco-social labels rather than the strongest. See our fact sheet for more on the strongest farmworker labels including Fair Food Program and Food Justice Certified. Promoting and prioritizing products from farms protected by a legitimate farmworkers union. For an example of a newly organized farm, see our story of Familias Unidas por la Justicia and Sakuma Brothers Farm. Tell these major grocery retailers to use their multibillion-dollar purchasing power to empower not exploit farmworkers! Please use your power for the good of all. Please promote and prioritize products from farms protected by a legitimate farmworkers union. I shop at trader joe’s more often because I can find more organic products there. So I’m hoping they’ll follow this.